Last March, the Obama administration placed the LPC on the threatened species list. This U.S. Fish and Wildlife Service designation makes it unlawful to hunt the bird and requires that a recovery plan be implemented. But some have argued that the reforms should have been a lot more radical. But this year, there’s not much to see. Selman drove me around the ranch to show me why. As she stalled her mud-caked Suburban in view of the property’s one remaining lek, she stared out at what she views as the true enemy, some 10 miles away: wind turbines. Though environmental conflicts often involve wildlife conservationists pitted against destructive oilmen, the true clash may now be between the green energy contingent and the naturalists. Here, “where the wind comes sweeping down the plain,” turbines may be the most immediate threat to the LPC. The bird fears the vertical turbine structures on the otherwise flat terrain of mixed-grass prairie and sand sagebrush–stubbled rangelands. The problem comes from the LPC’s perception that they could be a perch for a raptor, according to Jay Pruett, director of conservation at the Nature Conservancy of Oklahoma. 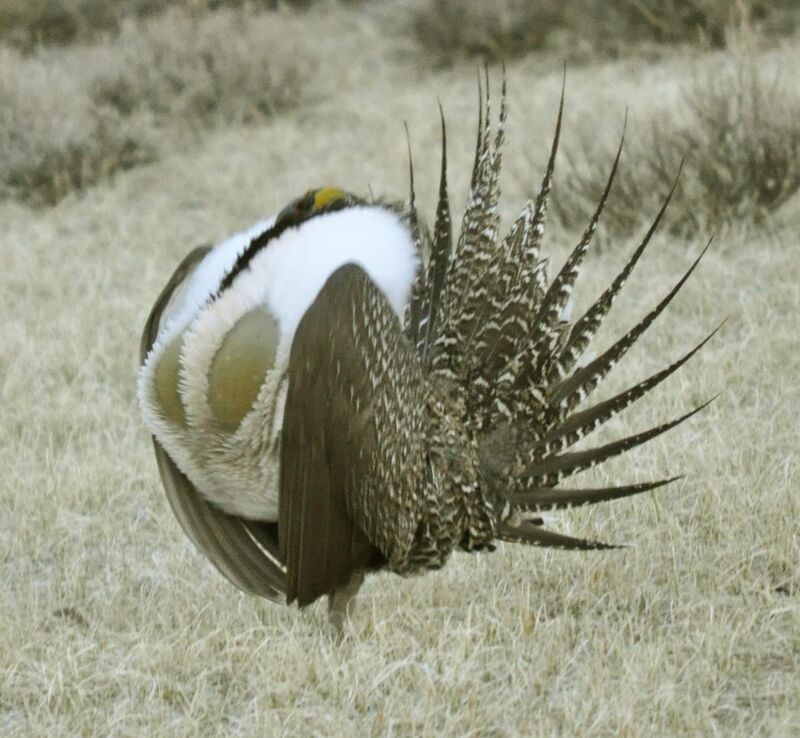 “While males on a lek may only have one thing on their mind, and they may not care so much about a vertical structure, females looking for a spot for their nest that will be safe for themselves and their chicks will avoid vertical structures if they can,” he says. The bird exhibits “avoidance behavior” up to a mile from a wind turbine, according to Ya-Wei Li, director of endangered species conservation at Defenders of Wildlife. The problem is exacerbated by an unlikely adversary: the pro-green Sierra Club. Right now, the Oklahoma Corporation Commission (the state’s public utilities regulator) is considering a plan by Oklahoma Gas and Electric (OG&E) to raise its rates and update older power plants to current Environmental Protection Agency standards. But the Sierra Club is trying to get OG&E to instead shut down its noncompliant coal power plants and replace them with wind and transmission infrastructure. Replacing the 2,854 megawatts generated by the old coal OG&E plants in Muskogee and Red Rock would require some 28,000 turbines, all of which would further limit the LPC’s habitat. The Sierra Club argues that climate change is the largest long-term threat to species like the LPC; it points to the devastation the drought has wrought on the birds. Weaning power companies off dirty coal and integrating more wind power could be better for the greater good, says Whitney Pearson, an organizing representative with the Sierra Club’s national Beyond Coal campaign. She’s starting to realize she may not have a choice. 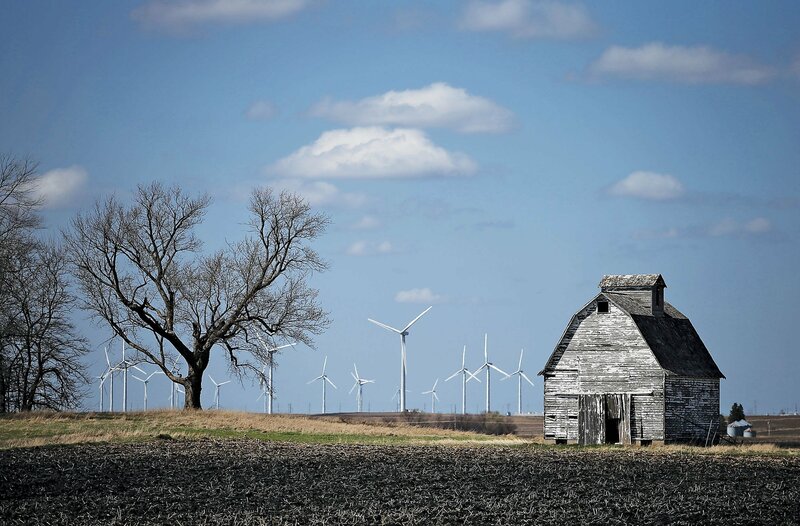 In 2008, with three friends, she started a Save the Prairie activist group, which she describes as “us just raisin’ hell.” They attend wind energy conferences, as well as government and environmental organization meetings, to promote preservation of the prairie and the wildlife. They’ve also given speeches, taken out radio ads and penned opinion pieces in support of the lesser prairie chicken. Nationwide, this is a crucial time for wind energy. 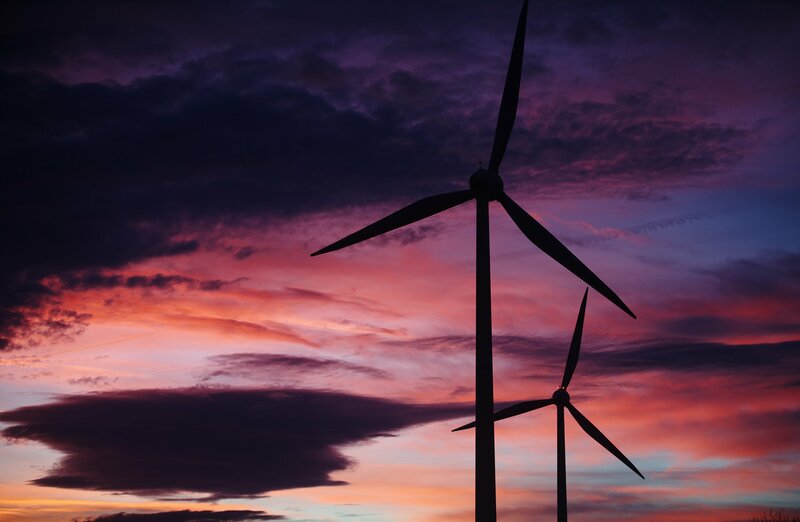 The American Wind Energy Association, a trade association, and those in the industry want Congress to renew a tax credit of 2.3 cents per kilowatt for wind-generated power. But opponents say these incentives are a blight on the federal budget, without a return on investment: Congress’s Joint Committee on Taxation estimates the existing tax credits will cost Uncle Sam some $3 billion a year. Back in Oklahoma, the big bluestem grass looks russet in the late-afternoon light, and the yuccas are dried like white roses. Driving away from the lek back toward her ranch house, Selman looks out at the wind turbines rising 400 feet to the sky. Her prognosis for the survival of the lesser prairie chicken is bleak. “I don’t know if they’re going to make it,” she says. There is one last thing, though, that provides a modicum of hope. A bit south of Selman’s ranch, toward the Black Kettle National Grassland, sits an area under the tribal jurisdiction of the Plains Indians—who view the LPC as sacred. In fact, the ceremonial dances of the tribes in the region are in large part derived from the bird’s lek choreography. The Cheyenne and Arapaho tribes tell of an origin story they call the Great Race. It was a relay competition, says Cheyenne Chief and tribal traditions leader Gordon Yellowman, between four-legged animals (elk, deer and buffalo, for example) and two-legged ones (human beings and birds such as eagles and magpies). The winner would have the right to hunt and eat the loser. 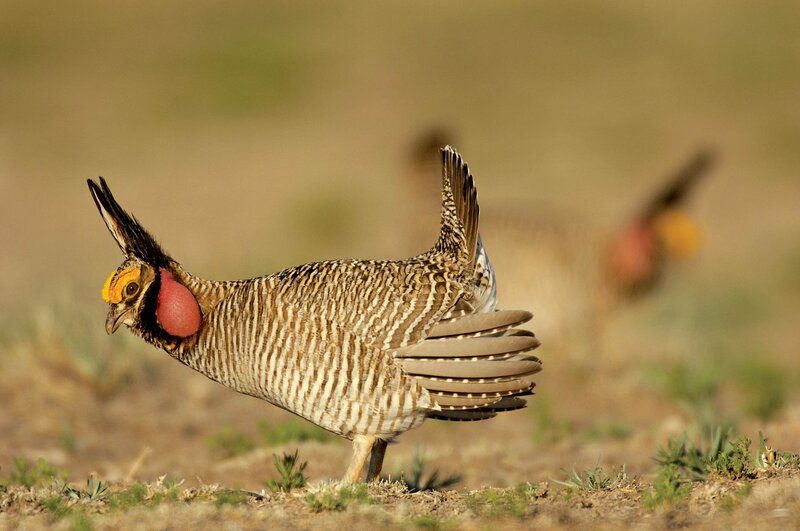 The lesser prairie chicken chose not to participate in the race—yet celebrated wildly with its fast foot movements after the two-legged contingent crossed the finish line first. That victory dance became the war dance for the Cheyenne and Arapaho tribes, representing companionship, triumph, renewal and fertility. Male dancers, with two-feathered bustles atop their head, mimic the LPC’s foot thumps while performing at powwows. Drums beat in the arena, and traditional whistle instruments imitate the bird’s spirited song. Yellowman calls the accelerated foot movement “the sneak-up”: thwuck-thwuck-thwuck-thwuck. “It radiates like thunder through the ground,” Yellowman says. It represents the “apex of sacredness.” The Native Americans, of course, know about encroachment on their territory and can identify with the bird’s plight. The Cheyenne and Arapaho tribes have done what they can to both modernize and maintain tradition: They have three wind farms on their land—but have kept them far from the LPC’s habitat.